Below are Box Office Collection Report of bollywood film Begum Jaan With his review, budget and total box office and worldwide collection status. Begum Jaan movie lead star cast is Vidya Balan, Ila Arun. Begum Jaan is an indian History, Action Film of 2017, directed by Srijit Mukherji & produced by Mukesh Bhatt, Vishesh Bhatt & Vishesh Films, Play Entertainments. 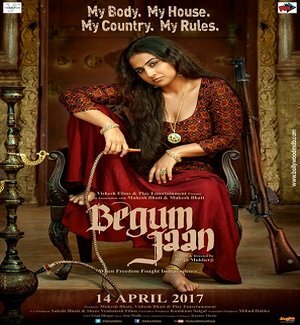 Vidya Balan's film Begum Jaan collected 3.94 Crore on its 1st Saturday after opening at 3.50 Crores, according to a report on Boxofficeindia.com. This takes its two-day total to Rs 7.44 crore. 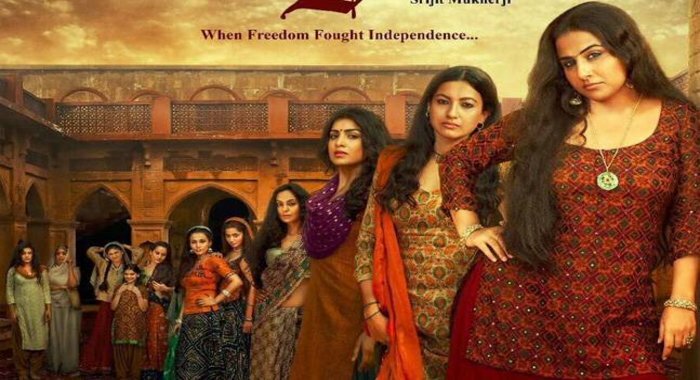 Storyline:- Begum Jaan is a 2017 Indian History, Drama film. Eleven prostitutes refuse to part ways during the partition between India and Pakistan. It is releasing on nearly 1200 Screens in India. Film is released on 14 April 2017. (1) The movie is definitely at least one time watch..
(3) Vidya Balan, the Hero, the lead actress, the shoulder that carries the responsibility to take the movie to the stratosphere of cinematic experience. Bold, brave, brazen, She doesn't have to be loud or melodramatic. Her eyes, her voice modulation and her pause speak loud and clear everything that She and the Director want to express. Absolutely brilliant as Begum Jaan, She is the "Jaan" of the movie without a doubt.